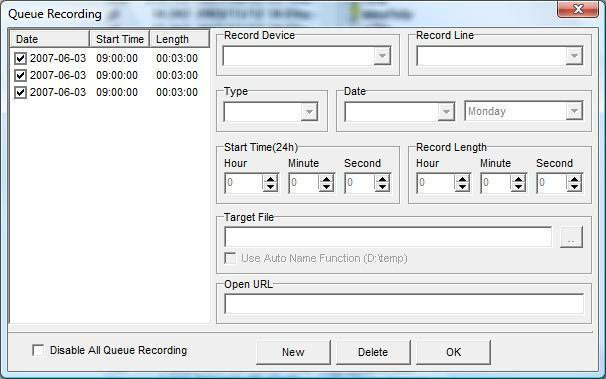 By clicking the button, you can enter the recording queue design form. To add a queue project, click the NEW button. To delete a existing queue project, select the queue project then click the DELETE button. OK button to exit from this form to the main form. You can choose recording type by check the WAV or MP3 checkbox. You can disable queue function anytime by check the "Disable Queue Function" checkbox. You can check "Use Auto Name Function" to use auto-name-generate function for queue recording. You can set the "Open URL" field to let program open internet stream automatically for you.